Can You Get A Tax Break From Moving? Did you know that the United States government is helping you with your move. They are doing this in several ways, but the first and probably the one that gets the most attention would have to be tax breaks. Most people don’t even realize this, but the United States government is offering tax breaks for people that have moved. What kind of tax breaks can you get from moving? 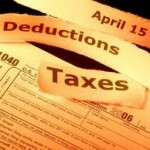 What moving expenses are tax deductible? Keep reading to find the answers to these questions and more. Tax season has begun and there are only a few days left o file your taxes. For many people, filing taxes is a big pain in the rear. They may end up owing money that they had not anticipated on, but sometimes there may be a tax refund headed their way. In order to pay less taxes and get this possible refund, people need to know what they can deduct from their taxes. The more you can deduct, the less tax that you will have to pay, and the more money you could possibly get back in the form of a refund. April 17th is the last day that you can file your taxes unless you have been given an extension by the Internal Revenue Service. If you have moved during the last tax year, then you are entitled to some tax breaks associated with that move. You need to gather up all of your moving related expenses and get them to your accountant or tax preparer. They will know which things are tax deductible and which things are not. Here is what you should bring with you. When you moved, you should have created a list. This list should have outlined all of the steps of the moving process. If you happen to have kept that list, it might come in handy now. You can use this list to get an idea of all of the expenses that you incurred when you moved. If you hired a full service moving company, then your receipt for the move will be good. If you decided to move yourself, then you will need your receipt for all of your packing supplies, the moving truck rental, and anything associated with the move. You may have even needed to use the services of an auto shipping company to help you move one or more of your vehicles. If you had to use some public storage facilities to store your things during the move, then these expenses may be tax deductible as well. Get all of this information together, and take it to your accountant or tax preparer. Times are tough in America. Everyone can use as much of a break as they can possibly get, and one great way to get a break is by writing off all of your moving expenses on your tax return. Who knows, this may be all you need to get an actual tax refund, and if writing off your moving expenses earns you a tax return, go out and enjoy it, because you deserve it. Next Next post: Should You File A Complaint About Your Moving Company?